So sure, Phoenix Wright: Ace Attorney - Dual Destinies never came out in a physical form for most of us, and that might still sting a bit. For those still yearning to feel justice in their hands, however, a different sort of medium has arisen. 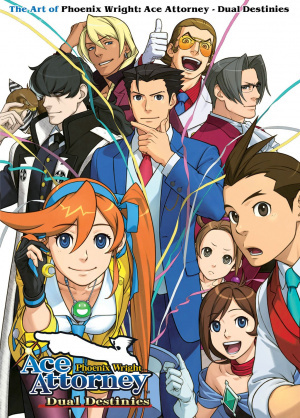 Capcom's courtroom style will be set to page this coming 9 June in The Art of Phoenix Wright: Ace Attorney - Dual Destinies, according to listings on Amazon. The art book will be published by UDON Entertainment, the studio responsible for many of Capcom's art volumes in the past. The listings state that the new art book will swear in at 240 pages, which is an impressive court record if verified. The original anthology, The Art of Phoenix Wright: Ace Attorney, was also 240 pages long but spanned the first three games of the series. The Dual Destinies art book can currently be pre-ordered on amazon in the UK, United States, and Canada, with other sources likely to pop up as well. Have you collected art books from various series? Let us know below! Getting this as soon as it's out. I NEED IT. no objections!.... HOLD IT! except for ebay scalpers! This is that one thing I didn't know I needed in my life but now I'm positive I do. Im sure the price will be up there. Amazon be like TAKE THAT! A 240-page paperback for £34? Nope. @Spectra_Twilight I'm afraid I have to agree; as much as I loved DD, the difficulty was the weakest part of it to me. The solutions and contradictions were made almost annoyingly obvious, and I felt the last two cases in particular had the potential to be more complex than they were. Still a great game though, and the artwork is one thing that definitely was up to par with the rest of the series. Are these the same artists from Project Justice/Rival Schools? Anyway, a tad expensive for a paperback, although it has a lot of pages.